Just wanted to let those three little words sink in for a second. Most on this site would agree that this line, with a couple exceptions, is not among the best of choices to place your investment dollars. I tend to agree with that sentiment. I am also a fan of building sets and as such this line is pure gold. 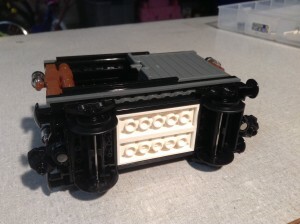 The sets are reasonably priced, have great builds, and come together as a group nicely. For the record I have grabbed a few of these sets at an extreme markdown just in case people forget about the "Lone Ranger" aspect and see them for what they are, excellent Western themed sets. 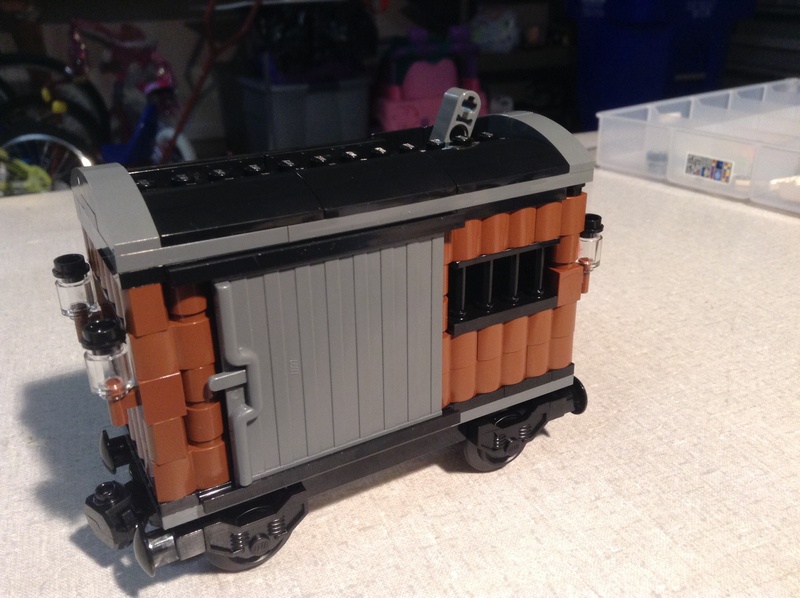 The best investment potential in this line is undoubtedly 79111 Constitution Train Chase, but, it also suffers from having "Lone Ranger" as part of its name which makes very reasonably priced among Lego trains. As of early March of 2014 it is still available for under $100. 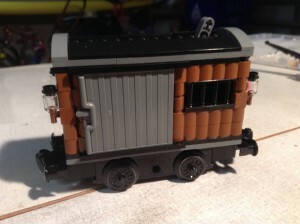 For that you get a 37 " x 22" oval track and an excellent western style engine and tender. The rest of the set is nice, but not to the same standard as the engine. My only true complaint about this train is the lack of power functions, or even the ability to easily add power to the set. What's a Lego builder to do... MOC it. My intention was to add power while still having the set look as close to its original design as possible. 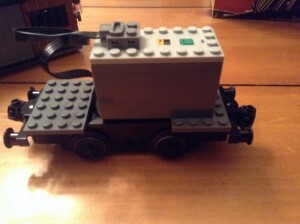 With this set there is simply no way to add power to the engine without drastically changing its appearance so my first thought was to use the coal tender but decided against it. Again it would have to be modified to the point of no longer looking like the same car and I simply had no extra pieces of the dark green color so I couldn't enlarge it if I wanted to. The flat car was also out for obvious reasons. 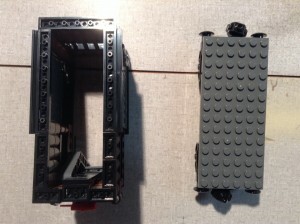 Luckily the prison car lends itself nicely, it's a large open box, perfect to hold a battery box. The above shots shot the car in its original state, the "box" portion rests on a 6x14 plate with the wheels attached underneath. 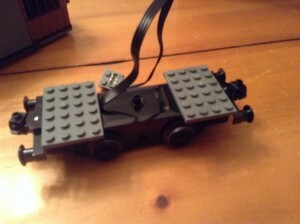 I started with a completed car and removed the 6x14 and everything underneath it. 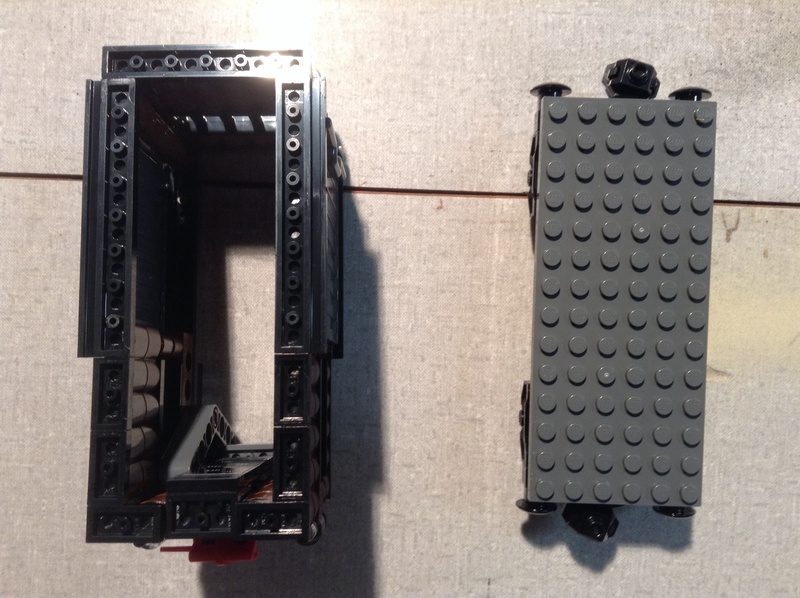 I then took a pair of 4x4 black plates and added two 1x4 tiles to them along the outer edges. 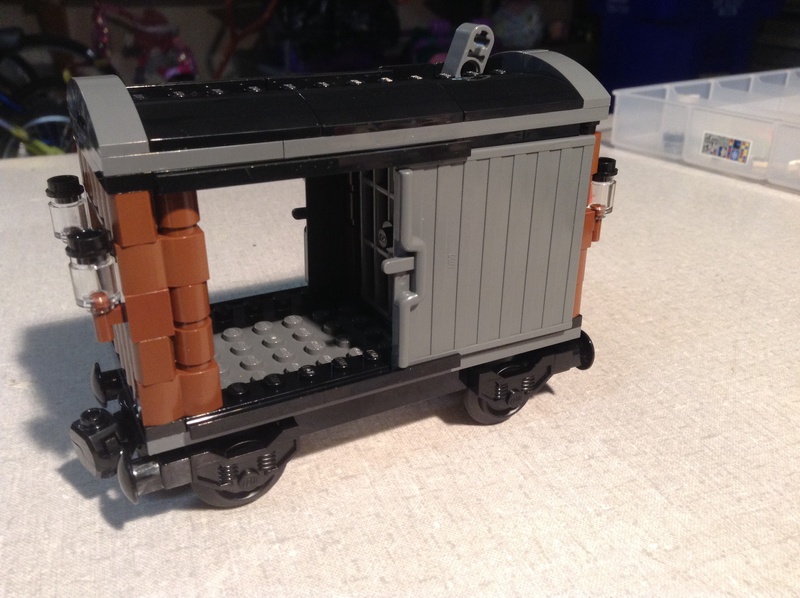 I added both to opposite sides of the train motor, but it looked "empty" so I also added a 2x4 brick to each side. When I was done it looked like this. I then added the magnetic couplers and a 4x6 plate to each side to hold the top portion of the car. Now for the battery box. I then placed the box over the battery box and decided to add a 1x6 to each side to make it look like the original 6x14 was still in place. This is the finished product. The result looks about as good as I had hoped, while the internal jail door had to be removed the functionality of blowing of the back of the car still works fine. What I was unprepared for was the speed default on Lego train motors, turns out that if you don't have a speed controller they are set to around Mach 5 and will send a small train such as this flying off the tracks, much to the delight of my seven year old. Looks like I'll be getting the IR sensor and remote after all. There is room inside the car to add it and the wire can run through the existing hole where the lever is. I hope y'all enjoyed this little tutorial and who knows there may even be money to be made adding power to sets like this and flipping them, if anyone tries that let me know how it goes. 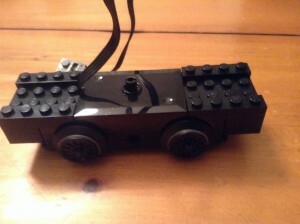 All the parts are common and inexpensive, I had all of them in my parts bins, the electronics I ordered from Lego for a total of $55.00. This was a fun and fairly inexpensive little project that yielded a nice little powered train, or at least, it will once the IR receiver and remote arrive. Seeing a train fly off the tracks would delight me, too, and I'm a 35 year old boy. I've been thinking about attempting this (adding power functions, not sending trains careening off tracks) so your tutorial was very helpful - thanks! The rechargeable battery pack comes with a speed control built in, but it's $50.00 plus $25 for the charging cable (you should be able to find a charger cheaper) vs $13 for the AAA battery pack. I'm sure if you want you could still crank up the speed and send your trains flying though. I am using the 9v system, so no need for a big battery box. I have mounted the 9v engine under the tender. That's really simple to do and you don't need any extra parts. p.s. the train has a tendency to derail in the corners. I did consider that, but those 9v motors are getting harder and harder to find and more and more expensive as time goes by. 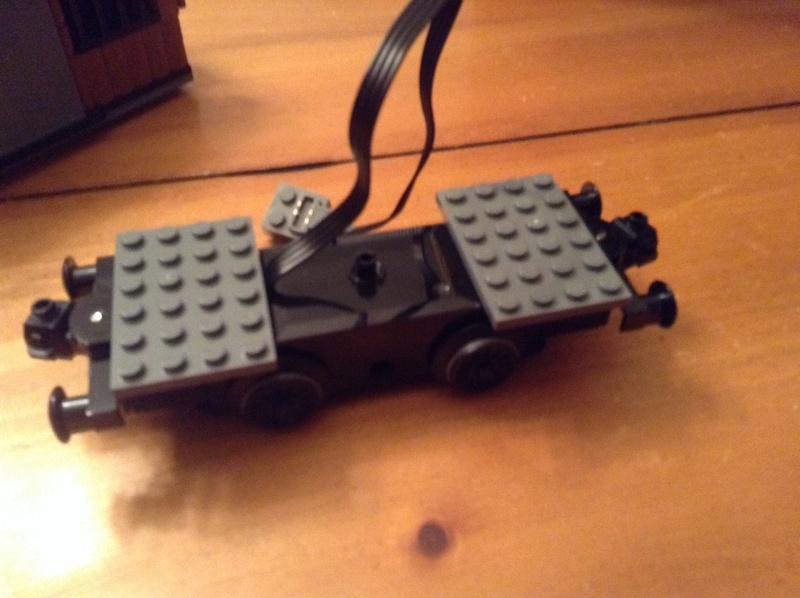 I wanted to stick with parts that could be ordered directly from Lego. I did it with our passenger train while it was on a table (about 40" off the ground). Accidentally went the wrong direction with the remote as it rounded the corner and it went straight right off the table. Wasn't a pretty site.. NTSB were all over it. Turns out the engineer was careless with his speed and not properly trained to handle speed setting #7. Excellent blog - I was looking into doing this and greatly appreciate the insight. Thank you. It was much easier than I though it would be, and it really is a cool train that deserves to be powered. Nice work. Very clever design. 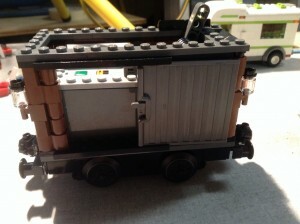 I did the same thing but added the battery box to the coal cart, made a bit of a hack job of it though. Might have to give your solution a go next time I bring it out. "it would have been nice to see it moving..."
Thanks... I may have to give it a try. Good idea and nice set-up. I have multiple trains and didn't want to motorize them all individually, so I built a motorized boxcar that I can swap between trains. I use it for my Constitution, Ghost, and custom trains.